Type: Rigid Stem, Every Angle & Distant (Capillary-Maximum up to 15 meters). Sensitivity: 0.2% of Range Span. Gas Filled TemperatureGauge overcomes most of the limitations of other members of family. Practically any stem length can be offered and capillary length as long as 20 meters, without any loss of accuracy. Inert, non hazardous, non toxic nature of the filled system makes it virtually ideal choice of all types of industries. Used of Inert gas N2 is non-polluting & Environment friendly. All SS, Gas Filled Thermometer. 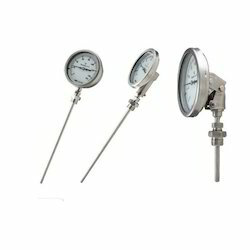 We are a unique entity in the industry, actively committed to offering the optimum quality range of Gas Filled Thermometer. Note: for more details refer PDF file.